﻿Samantha Oleson at the NMC Barbecue in 2007For many northern Michigan residents, the annual NMC Barbecue is a spring tradition. For Samantha Oleson, it goes back a lifetime. The 22-year-old is part of the fourth generation of the Oleson family to carry on the fundraising picnic under the pines started in 1956 by her great-grandparents, Jerry and Frances Oleson. This year she formally joined the Barbecue Board, the volunteer committee that spends several months planning the Barbecue, set for May 21 on NMC's main campus. But the Sunday before Memorial weekend has long been a dedicated date on her calendar. Mark, Frankie, Don and D.J. 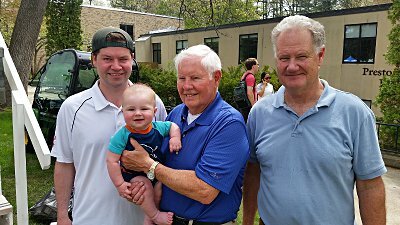 Oleson: Four generations enjoy the 2015 BarbecueA former dual-enrolled NMC student, Oleson is among a group of four cousins in the fourth generation of the family who now work in the Oleson’s stores. They continue to donate all the food for the Barbecue, which drew 7,678 people in 2016. On May 21, they’ll fan out for different day-of duties. Even fifth-generation Frankie Oleson, age 2 and a half, gets a job. They’ll still squeeze in time to enjoy the meal themselves. Besides the meal, the Barbecue includes classroom and program displays, free live music, a veteran’s tent and an alumni tent. 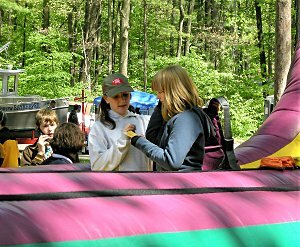 Separate ticketed activities include children’s games and a cake walk. Tickets are $6 in advance ($8 on Barbecue Day) and on sale now online and at Oleson’s Food Stores. Visit nmc.edu/bbq for more information.